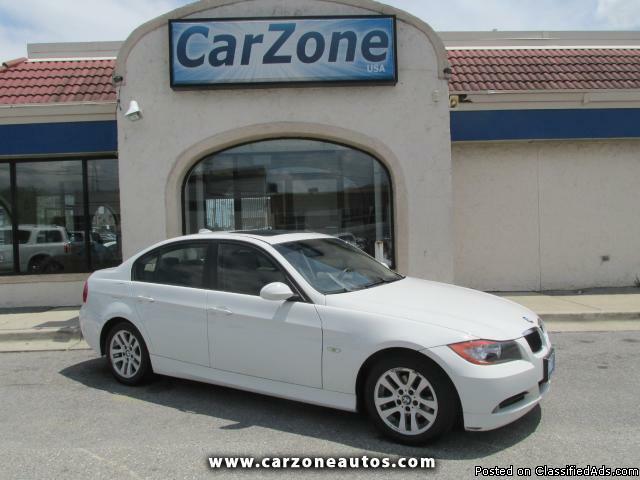 xxxx BMW 328i | 6-SPEED MANUAL TRANSMISSION | Alpine White with Beige Leather Interior | Introduced in xxxx, the 3-Series is BMW's most popular model, and like its predecessors, the xxxx BMW 3-Series is an award-winning car. Car and Driver gave the 3-Series one of its 10 Best Car awards for xxxx, further claiming that "constant upgrades have kept the 3-series on our 10 Best list for a record 16 consecutive years." Edmund's named it "Most Wanted Sedan under $35,000" and Consumer Guide calls it a "Best Buy." The 3-Series also won the "World Car of the Year" award at the xxxx New York Auto Show. Equipped with a 6-Speed transmission, push start ignition, leather heated seats, rain sensing wipers, dual automatic climate control, CD player, aux and USB input, and a beverage cooler, the 328i is sporty, fun to drive and offers superb handling. If you want a car that'll you love driving, the 328i should definitely be on your test drive list!